This class is a challenging, high intensity workout featuring more complicated and more intense choreography than a basic step class. Step III is ideal for those wanting an advanced level workout. "I am an 18 year member of MAC and I’ve been taking step class at MAC for many years. Kathy’s Saturday morning extreme step aerobic class is WONDERFUL! I look forward to it every week! The cardio workout leaves me a hot, sweaty mess after every class but isn’t that what it’s supposed to do? The choreography is challenging yet each routine flows into the next so smoothly and my brain gets a workout too! The routines change every couple weeks so there’s always something new to learn and it is fun. For newcomers, Kathy will always show them an easier alternative for each part of a routine so they can get used to it. MAC is probably one of the few gyms, if not the only gym, locally that offers an extreme step class and that’s an advantage. 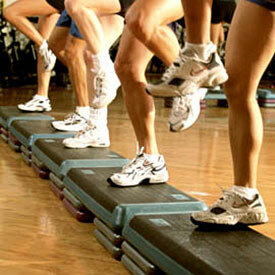 The Saturday morning extreme step class combines cardio and agility and gets my weekend off to an energetic start! ~Amy"